A few weeks ago Chef Marchetti of District American Kitchen & Wine Bar, in downtown Phoenix, debuted a new seasonal menu. The summer menu features food and cocktails prepared with local ingredients including herbs from the restaurant’s garden and sustainably farmed produce from local growers. This past weekend I had a chance to try some of the new items and I'm excited to share them with you now.We started with a few cocktails: the Dandelion Old Fashioned and the Mushroom Manhattan. Of the two the Dandelion Old Fashioned was my favorite. 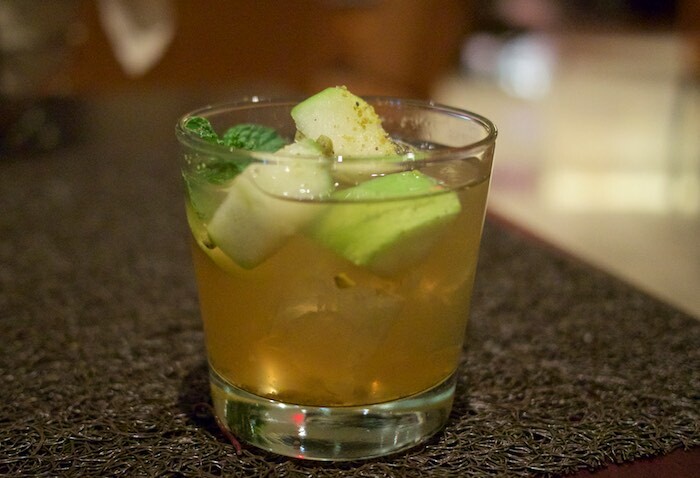 It features Angel's Envy Bourbon infused with green apple, honey and dandelion leaves. Very light and refreshing, perfect for summer and the meal to follow. 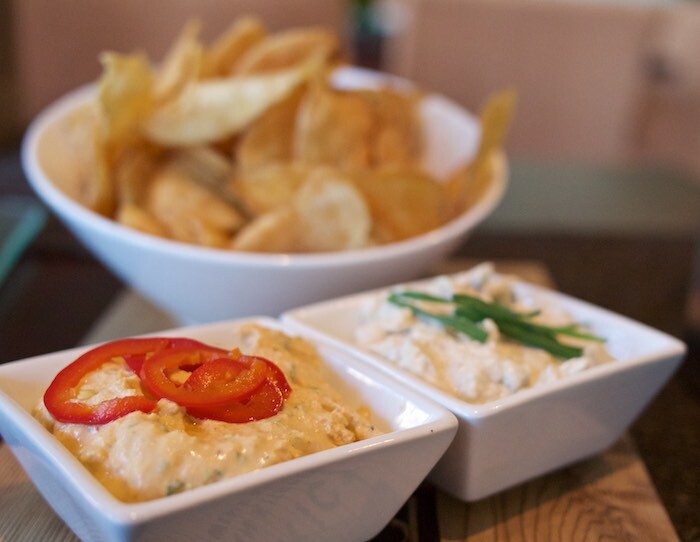 While deciding on dinner we snacked on lightly salted house-made potato chips accompanied by two completely different and delicious dips: a spicy sirachi cheese and a fresh chive. My dining partner and I had a hard time choosing which we liked better, as they were both equally interesting in their own way. 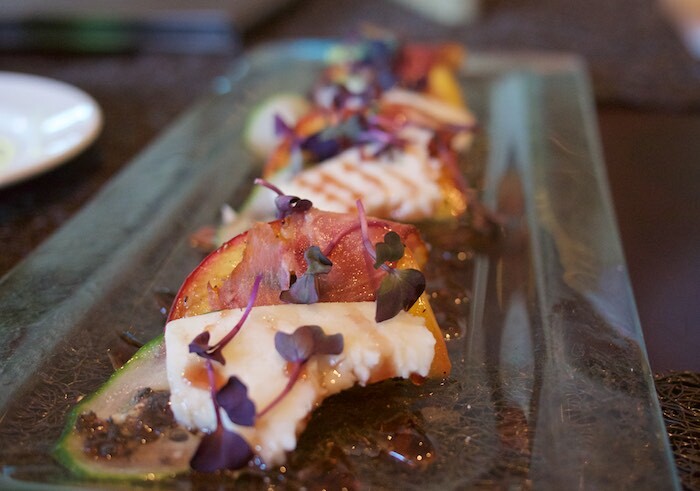 We also shared the grilled peaches and goat cheese appetizer which included pieces of tasso ham and shaved cucumber. I could have easily made a meal out of just this, it was that good! Throughout the summer months all entrees at District American Kitchen are only $22, which is a steal if you ask me. 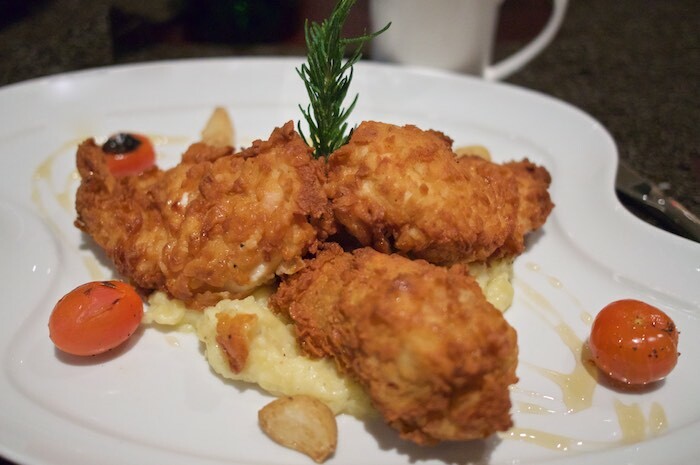 We tasted the fried chicken, served with roasted garlic smashed potatoes and a side of gravy made with local Shcreiner's chorizio. The chicken, which was mostly white meat, was moist and tasty, with hints of honey & lemon. 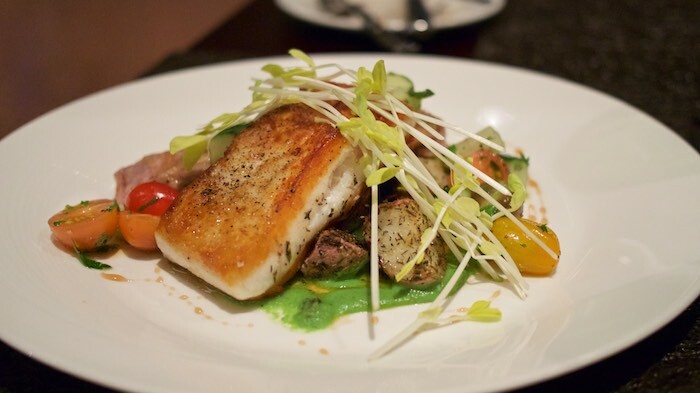 We also ordered the chef's daily special: halibut served with roasted potatoes & tomatoes on top of a sweet pea puree and a blue corn crepe filled with goat cheese and mushrooms. I enjoyed the fish but I was smitten on the cheese filled crepe. 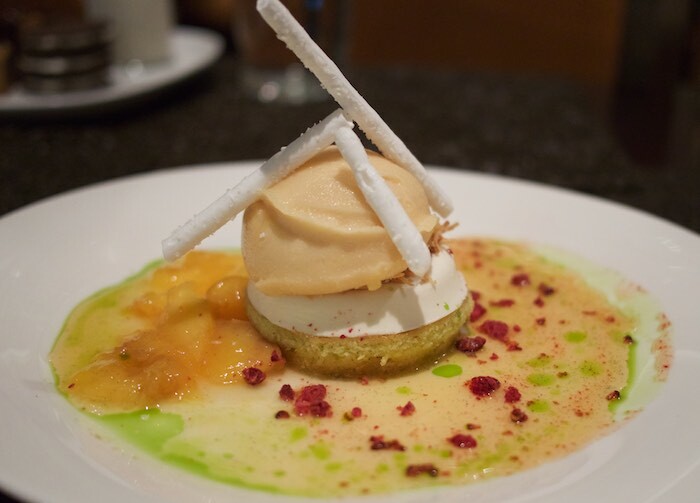 All desserts are made in-house by Pastry Chef Winnona. She does an amazing rendition of the childhood favorite, cookies and milk. 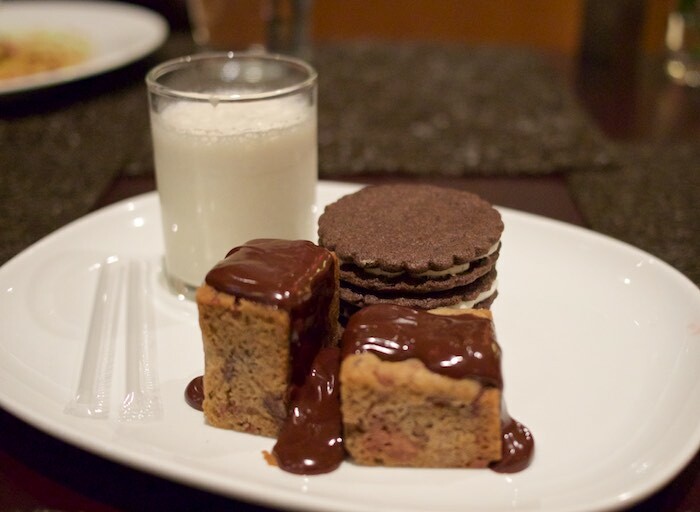 A small malted milkshake is served alongside chocolate chip bars and chocolate sandwich cookies, similar to Oreos. Though delicious my favorite was the coconut cream panna cotta with a layer of toasted coconut, served over an olive oil cake and topped with house-made mango sorbet. I couldn't get enough of this light and refreshing treat! I can attest that the new summer menu at District American Kitchen & Wine Bar includes lots of delicious food. But don't take my word for it....try it for yourself. This meal was provided complimentary. However, all opinions and comments are my own. I am going out to pick dandelions right NOW so I can make myself a Dandelion Manhattan! Swoon. This all looks good but I would LOVE that old fashioned drink. The green apple flavor is right up my alley! Oh wow! The desserts look amazing! The mango sorbet with panna cotta sounds incredible! You have the most interesting dining adventures! Another fantastic meal. Such an interesting and eclectic menu! Sounds like a fantastic meal! You always visit the most exciting places. My favorite would be the fried chicken and mashed potatoes. What a meal! I have a feeling I wouldn't be able to stop eating that sriracha cheese dip. Woah you're living it up!! I'm in love with the Dandelion Old Fashioned. What a neat, unique idea!